Hale Door Model Pet Door Large 11" x 16"
Pet Stuff Warehouse™ Home > Dogs > Doors > Hale Pet Doors > Hale Pet Doors - Door Mount Models > Hale Door Model Pet Door Large 11" x 16"
Select Door Thickness: Between 1 3/8" & 2" Between 5/8" & 1 3/8"
Why Choose Hale Pet Doors? Click here to find out! Tired of being your doggie’s doorman? Add a Hale Pet Door™ to your “people door”. This is one of our best selling models and is one of the easiest to install yourself. The Door Model fits perfectly in wood doors, metal doors, hollow core doors, raised panel doors and even French doors. Quality, energy efficiency, safety, and security are priorities with Hale. 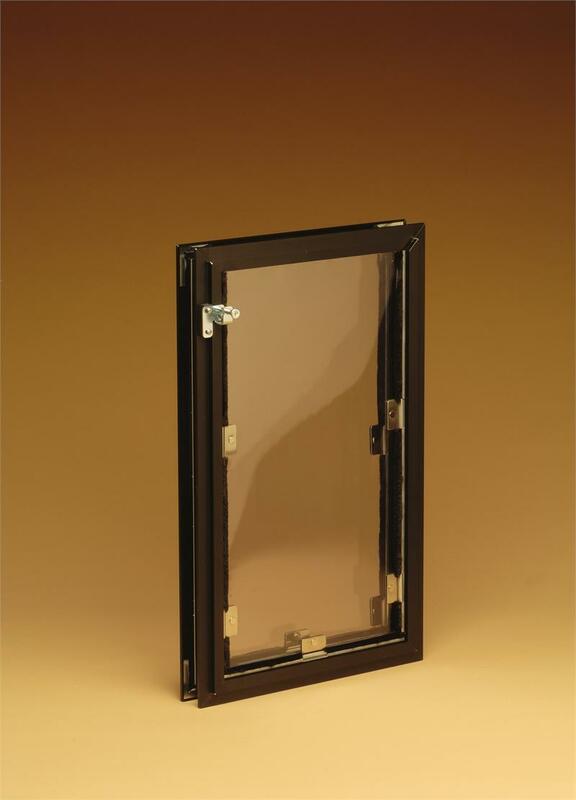 All of our pet doors are rated highest in insulating and sealing, ensuring protection against wind and insects. New optional "raincap" (shown here on our wall model) free with purchase. First of its kind in the pet door market! Hooks to the top edge of the outside frame and helps protect against water intrusion. NOTE: If ordering a secondary exterior security cover and raincap, you must choose a side loading security cover so the top is available for the raincap. Please see our sizes page for more information if you need help in choosing the proper size. Normally a pet door comes with clear flaps. However, there may be situations where an opaque flap is appropriate. (i.e. the pet door is in a bedroom and a person wants darkness, or a pet door is installed in a bathroom and privacy is needed). In that case you may choose to have one or both flaps made black or white. NOTE: if you have a pet who has been used to having a pet door with clear flaps and a darker cover, you may need to retrain the pet to use the pet door if you purchase one with black flaps as they may think it is the cover in place. Pick one frame color for your pet door or pick mixed and get a different color on the inside and the outside. Click "details" for a picture of the colors. Pet Door Frame Colors Available. Arizona Beige -- hard coat paint, looks like coffee with a couple of creamers added. Standard top load or pick a side direction. See "details" for a photo of side vs. top load covers. The security cover comes standard on our models as an interior top load version. On occasion there will be an obstruction above the pet door that prevents the security cover from being raised up far enough to remove. In those instances, we provide an optional side load model. The picture at the left shows a right side load door model and a top load door model with the covers partially inserted for visibility of the load direction. Pick a cover to complement your pet door or your decor. 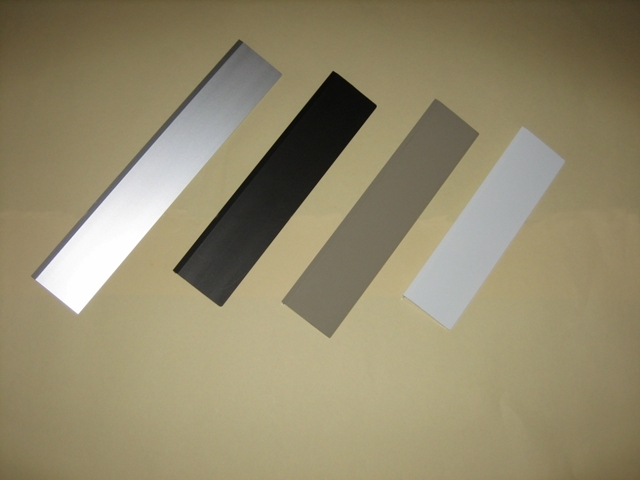 We offer two materials and five color choices for our pet door covers. Our standard covers are made of opaque, textured King Starboard® and each of the four available colors are designed to complement the four frame colors. 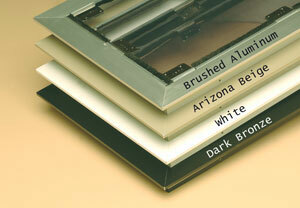 As an alternative, you can choose our translucent gray Lexan® cover to go with any of our frame colors. *Note: Dolphin Gray Starboard cover is not pictured above. Occasionally, our customers have also requested an additional exterior security cover be added to the standard door model. This option is also available. 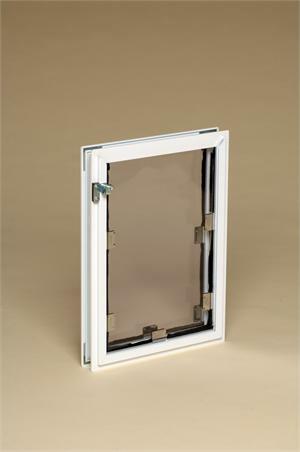 This is generally used if you need to be able to lock the pet door from the outside without access to the house (i.e. a worker comes into your yard and needs to temporarily lock the pet inside) or to prevent a pet from chewing on the flaps while locked out or to prevent a pet from running into the interior cover if you have them temporarily locked out. Keep in mind that load direction is determined by looking at the door. If you want both covers to load from the same side of the door, you would need to order one as "left side load" and the other as "right side load". Also remember if you plan on using the optional raincap, you must specify a side load direction for the exterior cover. Raincap is optional on the door model. Click yes if you would like it included at no charge. The raincap is part of Hale's water containment and diversion system to help prevent moisture intrusion into your pet door. This awning like attachment hooks onto the top edge of the outside frame and helps protect from water intrusion into the pet door itself and therefore into your house. 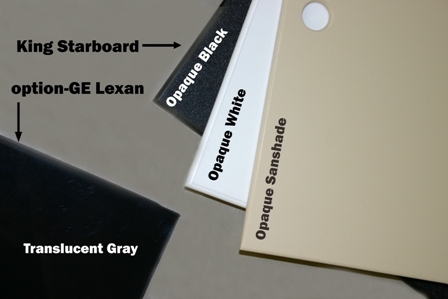 The raincaps are available in our four standard frame colors and will be supplied to match the exterior pet door frame. A training flap is optional. See "details" for situations when you may wish to order one. Some pets initially resist pushing through the regular pet door flaps so we offer a flexible training flap as an optional add-on. The training flap is made of a similar material to our regular flap but it has no strikes and has been vertically slashed several times to make it very easy to push through. It does not, however, provide the energy efficiency of our regular flap. Therefore, once an animal has gotten used to the training flap, the standard flaps should be re-installed one at a time. 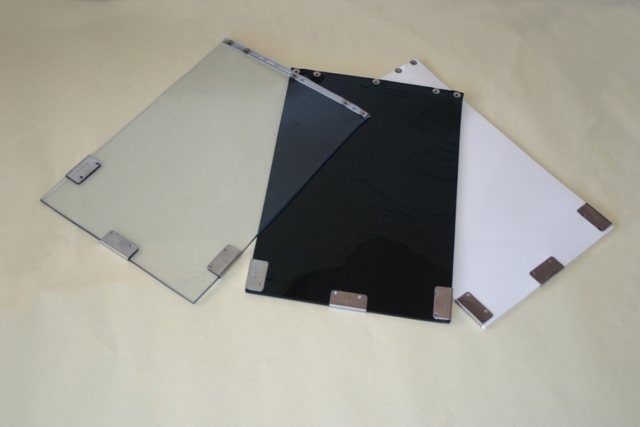 If you order this at the same time as you order your door, we will install it for you at the factory and send the regular flaps (predrilled for ease of installation) in addition to your door. 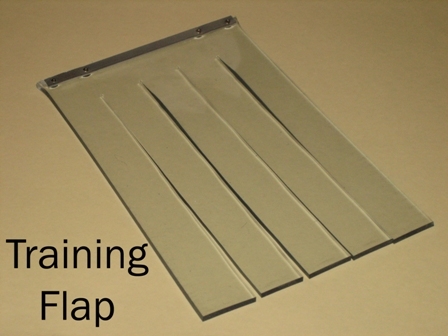 As a standard, only one training flap is supplied with each order. Typically, you would train the animal to use the single training flap, then switch it out for one of our regular flaps and finally attach the second regular flap on a double flap model. If you prefer to have two training flaps sent with your door, please order an additional one from our parts page. If you would like to order a training flap with your pet door order please do so by visiting our replacement parts page. 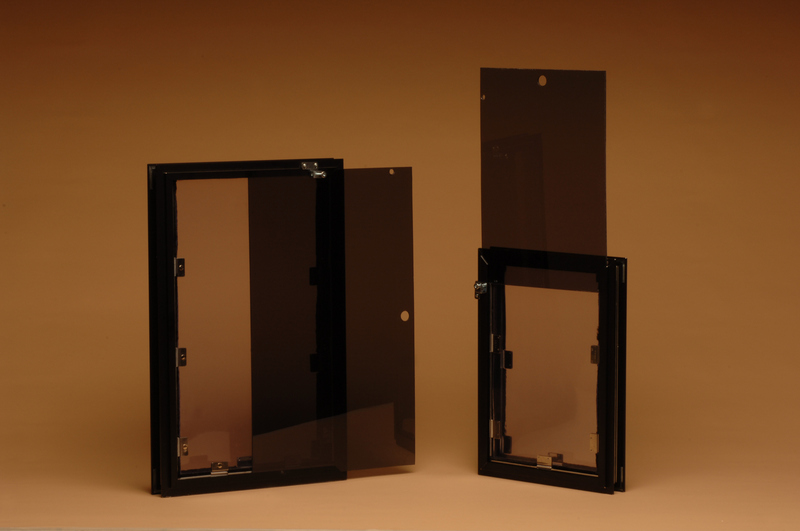 Most doors are between 1 3/8" and 2" thick and our door model is designed to easily fit these doors. If your door is thicker than this, please order our wall model. If your door is between 5/8" and 1 3/8", you can still order our standard door but will need to choose one of two possible modifications. You can order an optional buildout to add to your installation that will space the door frames the correct distance apart. Please add 10% to the cost of the door for a buildout. 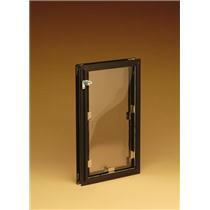 Your second option is to have the door unit factory modified and cut down to size. If you choose this second option, please be aware that the closer together the door frames are, there is a chance that the flaps may occasionally stick to each other preventing a good seal.